...I just thought I'd share. We took in Panama City Beach last October and came home with a crab for each child. I'll admit that the lady in the store did give us a bit more information than if we'd bought them at, say, a surf shop. She told us to get beach sand, make it thick enough to bury them in, and have spare shells. Lucy chose a tiny crab in a yellow painted shell, Clyde chose a large crab in a dinosaur painted shell, and Iris chose a medium crab in a pink painted shell. There names were Daffodil, Hermie, & Tarzan. We brought our new, "easy" pets home. We did some light research and assembled a home. Plenty of sand to bury and molt in, stuff to climb on, some new shells. Here, you see that Tarzan has already moved from his tiny pink shell to a roomy, shiny, white one. They ate, they drank, they socialized. But we wondered...they seemed, maybe, lethargic. And we wondered, why didn't they climb? Hermit crabs are supposed to love to climb. But, we figured, they're nocturnal, they're probably coming alive at night. Enter, new character. We were given an additional crab, by some friends of ours. We brought him home and decided he was a family crab. Stephen named him, "Nod." However, if a child's crab were to perish, Nod would become that child's crab and he/she could rename him. So we released Nod into our stellar crab-environment and excitedly watched for him to give us his approval. He liked it at first. But then he started trying to take Tarzan's shell. We panicked and started to measure him so we could order him a new shell. We felt sorry for him as we put him back in isolation. As I was researching the proper way to measure him and order shells, I started learning important hermit crab info...I got hooked and researched for days. Tarzan stayed in his new saltwater dish for 48!!! hours, people! They have each now survived their first molt! Daffodil has, in fact, survived two molts. After her first one, we noticed that she now possessed the tips of all her legs and a complete large and small claw! Daffodil showing off her new-post-molt leg tips and her complete claws! We, now, feel like somewhat seasoned hermit crab owners and wanted to warn unsuspecting beach tourists. Most people I know who have owned them have had them die fairly quickly and have not had a successful molt. But hermit crabs ARE easy pets!.... just not as easy as the beach stores would like you to believe! We had a combo Joshua's 1st b-day/Papa's father's day party. When I asked what Joshua was into so I could decorate his cake, the response I got was...Elvis! Well, Iris was pretty pumped! She loves Elvis (or the 3 songs of his she knows ;) So she wore her special Elvis shirt (Thanks, Mrs. Amy) in honor of Joshua. 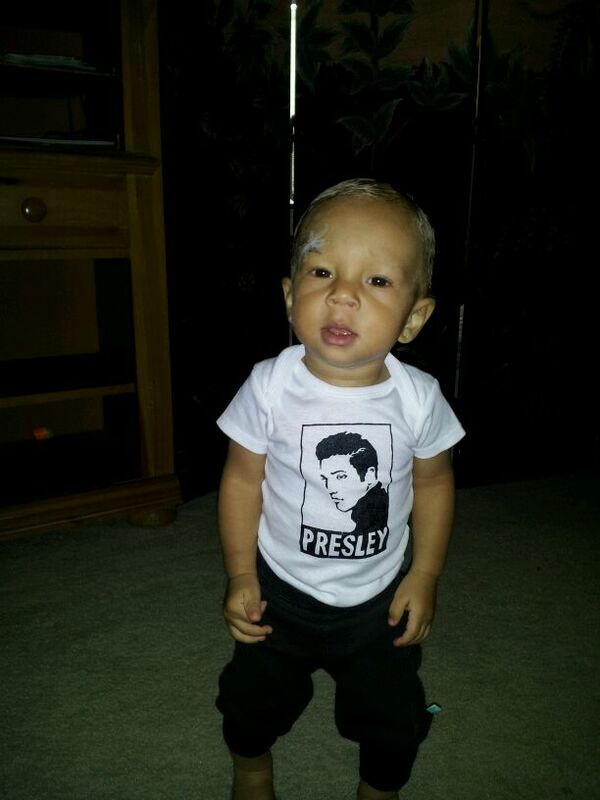 And later Papa forwarded a pic of Joshua wearing one of the Elvis onesies I got him! We had a great weekend at Dad's for Father's Day. We played outside, played inside, ate together, watched Dad's favorite commercial a few hundred times (since Janet recorded it for him.) It was awesome. We celebrated Father's Day on Saturday and went to church with Dad and Janet Sunday. Dad and I played along with the music during the worship service. We had a jolly time. Stephen and kids! They went in together and got him a wallet. Stephen teaching the kids how to do the cup routine for the "cup song"
Somehow we didn't get a pic of Dad with Sherry and I this year!! Ugh. Oh well...there's always next year! Museum & Zoo Time Again! We just can't get enough of these local favorites! My mom hangs out with us most Thursdays, because that's the day she gets to work from home. She tries to get done early enough to spend a good chunk of the day frolicking with us. One week we went to the zoo, where she renewed our pass! And another week we went to the local children's museum. I loved this tamarin watching Lucy draw his portrait... "Are you drawing my good side?" At the museum, Iris made a friend named....lets call her "Addie." Addie followed us around the whole museum and the two of them did everything together. They literally started off at the first exhibit together and stayed attached at the hip until we left. I really should have asked her mom for a playdate! Clyde taught the girls the knack to not popping the bubble...speed is key! And as always, playtime with Nena rocked! My group of 5 met Sherry & David, Dad & Janet, Dyan & Brent, and Bobby at a not quite central location (we were at an advantage, it was closest to us). And we had SUCH fun! Here they are after having a few presents place in their hands...every time they thought they were done, a few more gifts landed in their hands....turbie twists, things to capture bugs (these have been used a TON), dinosaur skeletons to assemble, etc... They've enjoyed them all! Much thanks to those who planned!